So I’ve been praying for rain all week prior to Greenbrier, and I got it. 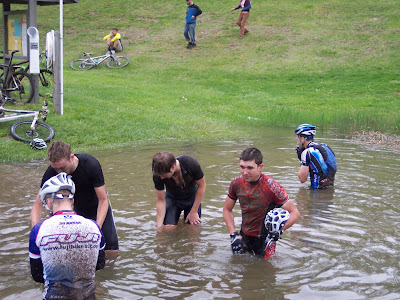 The course was inundated with water and mud throughout. The mudfest was stacked with some of the best racers on the East Coast with Chris Eatough, Harlan Price, Aaron Snyder, Kyle Hammaker, Jeff Schalk, and many others who are ready to throw down at will. Starting off, I felt great and was trailing the lead group of Aaron, Jeff, Kyle, and Harlan by just a few seconds, but as the high pace kept up on lap two I started to fall back until those ahead were just out of sight. Plugging along in my own little pain cave I churned out the same lung tearing effort that was produced at Fair Hill only to be caught and passed late in the race by Chris, who had flatted on lap one. In the end I finished up 6th and celebrated with a bath in the muddy lake to get cleaned up a bit. Now it’s time to concentrate on the Dirt Sweat and Gears 12 Hour race being held this Saturday near Fayetteville, TN. There should be some tough competition, but I’m ready to turn myself inside out on this occasion.